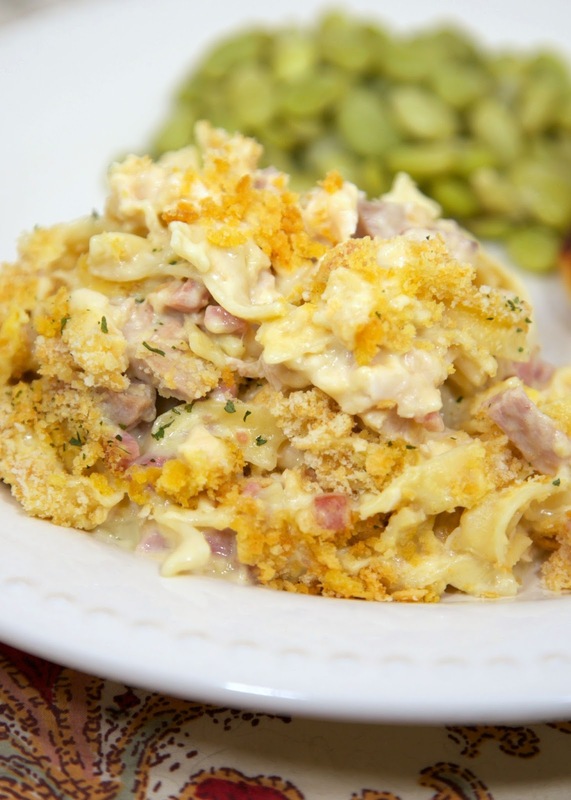 Chicken Cordon Bleu Noodle Casserole - chicken, ham, cream of chicken soup, sour cream, cheese and noodles - great weeknight meal! Can make ahead and freezer for later. Everyone LOVES this easy weeknight chicken casserole recipe! One of my favorite things about Christmas is getting a Honey Baked Ham. I absolutely love Honey Baked Ham! I am always looking for new ways to use it up. This year I am making this Chicken Cordon Bleu Noodle Casserole. We made this casserole as soon as Chicken Legs picked up the ham, and it was delicious! We ate it for dinner and leftover for lunch the next day. It was great both times. 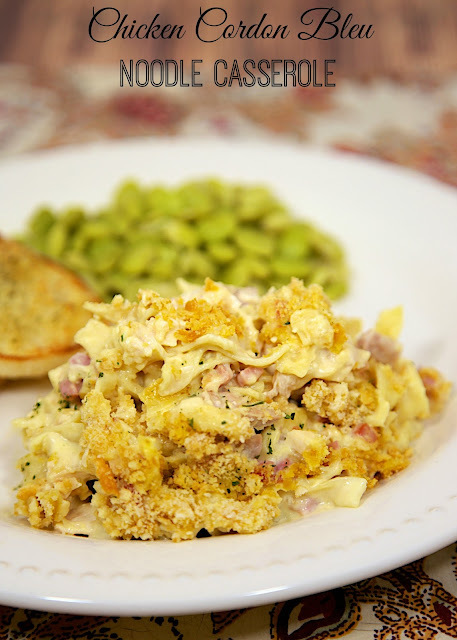 If you are looking for a new dish to use up any leftover ham this year, give this a try. You won't regret it! Cook egg noodles according to package directions, drain. Combine chicken, ham, soup, sour cream, and cheese. Stir in cooked egg noodles. Pour mixture into prepared pan. Mix together panko bread crumbs and melted butter. Sprinkle over top of casserole. Bake for 25-30 minutes, until heated through. I like chicken cordon bleu, I like pasta, I like casseroles so how could I not like this. We love Chicken Cordon Bleu so this sounds like a great alternative to the traditional way of having it. Can't wait to make it! When using the cream of chicken soup do you use the thick base straight from the cans or add the water and thin it out first? Just use the soup straight out of the can. When using the soup do you use the condensed base straight from the can or prepare it with water first?